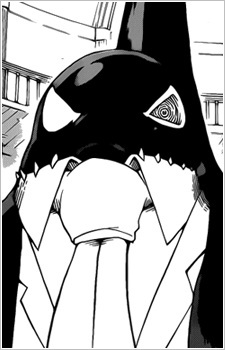 Sakamata is an Orca and No. 2 of the Ushimitsudoki Aquarium. He appears in the show by the pool with Kaizou. When transformed, he has four eyes and a suit figure with a red tie. His body becomes a cape and he has black hands with pointed fingers. He wears pants with a belt that has a buckle shaped like an orca's head.